Bradley MacDonald calls it playing restaurant with students. The tourism and hospitality faculty member oversees Fresh Twenty One, the student-run restaurant at Nova Scotia Community College Akerley Campus in Dartmouth. Fresh Twenty One is a fine-dining restaurant and classroom wrapped into one and it’s up and running for the academic year with a new name and a renovated bar. It is a communal effort. Students from tourism management captain the service while culinary and baking and pastry arts take care of the food. Even the graphic design program at the college’s Waterfront campus designed the restaurant’s snappy new logo. 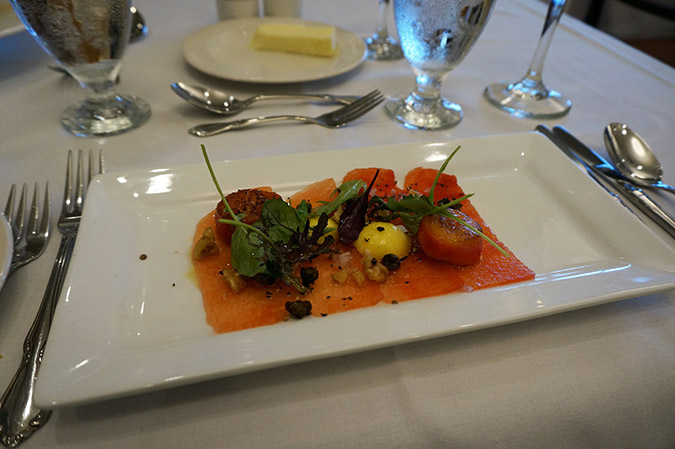 After walking past classrooms for welding and aircraft maintenance, a fine-dining restaurant is an unexpected surprise in the hallways of Akerley. Every morning, students hold a menu conference to learn about the day’s dishes, followed by a tasting of the wine parings. They learn mis-en-place (a French term for setting things in their place), formal table service and how to stock the bar. “We will run through service; steps of service, things to watch out for, how the actual service will flow from start to finish,” MacDonald explains. Students rotate through different roles, so it’s important to have a refresher before every service. At 11:30 a.m. students are ready to serve lunch dressed in crisp white shirts, clean aprons and black bow ties. As servers bring fresh rolls and appetizers to the perfectly set tables, MacDonald is at arm’s length with constructive criticisms. As part of the service excellence component of their diplomas, it is important students provide the best service they can and MacDonald comments frequently on the servers’ performance in front of patrons. While this might sounds embarrassing, it fits into the vibe of the live classroom and neither students nor patrons seem to be fazed by the discrete interjections. Alina Young, who’s in her first year of the tourism management program and enjoys being in the dining room with real customers, is proud of the quality of the food she serves. Dishes such as smoked ham and caramelized onion ravioli are only $7, while an entree of mushroom dusted salmon filet is reasonably priced at $12. Meals are plated beautifully and look perfectly professional — this is no amateur operation. Young hopes to pursue her co-op placement at a hotel this summer and will follow the hotel and restaurant stream of the two-year program. “We’re setting people up to be managers in industry,” says MacDonald. Karla Williams, who completed the culinary arts program in May, is about to finish the season cooking at Keltic Lodge in Ingonish and is looking forward to her future in food. After raising two children, the University of King’s College journalism graduate decided culinary arts was her true calling. Dinner service began in late October in the 80-seat restaurant. There is one service, at 6 p.m., where diners can expect a five-course meal for $35 and the same excellent service as lunch. Adam Ronan visited Fresh Twenty One for the first time recently. His experience at lunch was a pleasant surprise. The restaurant is open from mid-September until mid-April. Reservations are recommended for lunch and dinner. *For more information on the programs offered at NSCC see their website, nscc.ca. Find the daily menu on Fresh Twenty One’s Twitter account, @Fresh21Dining. There are 100 students enrolled in the culinary arts program and 98 in tourism management at Akerley campus. Culinary students prepare meals for 1,000 students and staff in the cafeteria every day. According to the 2013 NSCC graduate follow-up study, 95 per cent of students found jobs after graduation. Students go on to careers in restaurants, hotels, catering, bakeries and even the Canadian Armed Forces.